We are a building supply company that takes pride in our professional service and knowledge of the industry from start to finish of any project, big or small. You will be pleased with the personal attention you receive. We offer personal and business consulting, delivery, and sample. It would take hundreds of pages to list all the products we offer. This list is just a small sampling of our product line. Please contact us with any of your needs for your next project. 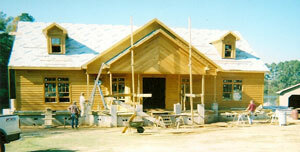 We are truly a full-line lumber and building products company. We service commercial contractors, home builders, industrial accounts, and do-it-yourself customers alike. We promise to give you our full attention, regardless of the size of your project. We will find the right materials for your job if we don’t have it in stock! If you need your materials delivered, we can do that too! mouldings * karate boards * AND MORE! High-grade building material, from concrete to roofing and tools to complete the job. We deliver. Call today! ©2019 The Woodpile Inc - Dothan Alabama Building Supply Company. All rights reserved.